Mel Shaw's incredible career as a Disney artist and animator began in 1937 when Walt Disney offered him a job during a game of polo. 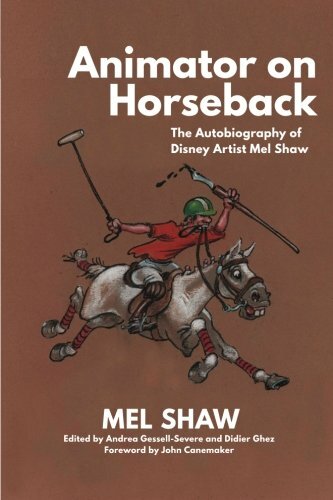 Packed with nearly 400 illustrations and photos, including exclusive Disney concept art, Animator on Horseback is the story of Mel's life, in his own words. When Mel arrived in Hollywood from Brooklyn, work for inexperienced animators wasn't easy to find. He landed a job at the Harman-Ising studio, but his career truly began when Walt Disney brought him on board to help with Bambi. Mel left Disney not long afterward to work on his own projects, including Howdy Doody, but in 1974 he returned to mentor a new generation of animators, and he contributed to such modern Disney classics as The Rescuers, Beauty and the Beast, and The Lion King.